2014 Breastfeeding Champions: Jan Johnson accepting on behalf of Cristin Stanley-Potter, John Lynch and Ana Maria Linares. Here in the Big Blue Nation, we’re used to having champions. The excitement and fervor is infectious, even for someone who only knows that when the ball goes in the hoop, it’s a good thing. But that’s exactly what champions do. In their own way, they create excitement and support for something they truly love, even in those who don’t really get their cause. When we laid the groundwork for LINK, we created a simple mission statement: to make breastfeeding easier for all Kentuckians. When we came up with that mission, we knew that we wouldn’t just be supporting individual moms and babies, but that we would be supporting everyone who impacted the experience of breastfeeding moms and babies. This would include businesses, journalist, researchers, community members, community builders, and professionals of all varieties – basically every day people who may or may not have a professional association specific to breastfeeding. And that is exactly what we look for when searching for our Breastfeeding Champions – those individuals who do something to support breastfeeding, even though they don’t have to. 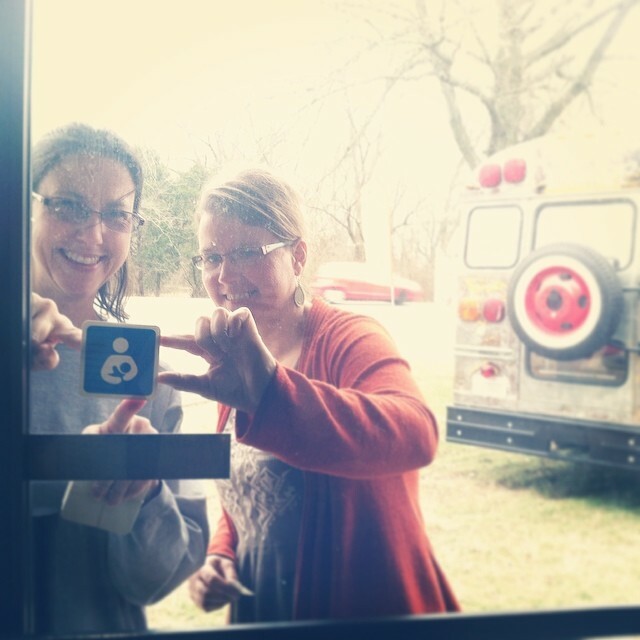 They help create excitement and community of support for breastfeeding. In other words, they make breastfeeding easier for all Kentuckians. 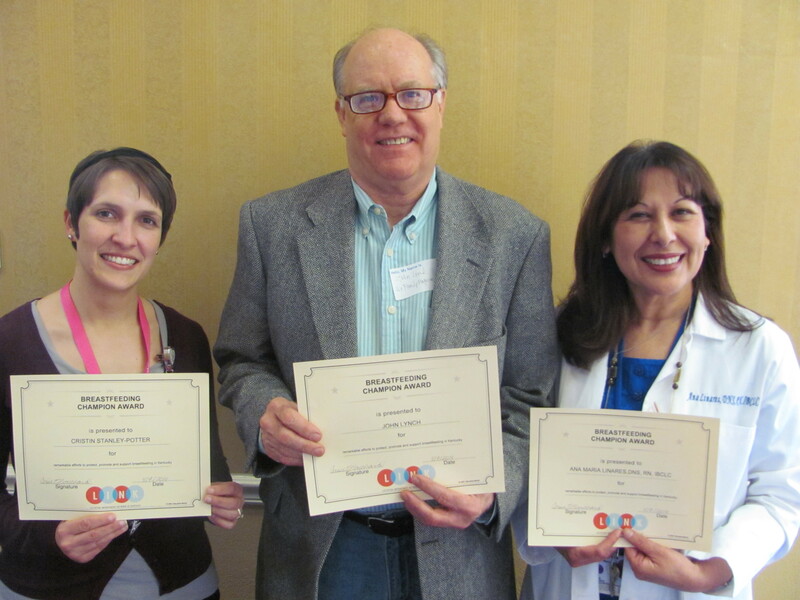 This year, we are excited to present our 2014 Breastfeeding Champion Awards to Cristin Stanley-Potter, John Lynch and Ana Maria Linares. Cristin Stanley-Potter is a CAPPA trained labor doula and fitness instructor. She is currently pursuing certification as a postpartum doula and lactation counselor through Intuitive Childbirth. During the past 4 years, Cristin has professionally supported mothers in Pikeville and the surrounding areas through their pregnancies, labors, births and postpartum experiences. Additionally, Cristin began Mother to Mother which is a closed Facebook group for mothers and mothers to be in the Pikeville area. On Mother to Mother, women are able to give and receive support and information 24/7. The support and safe haven offered here is critical for women in an area with very little professional and cultural support for breastfeeding. Cristin also organizes social events, play dates and educational events for the women in the group. She has three children over her own and has had three very different experiences during her pregnancies, births and breastfeeding. While she is extremely passionate about natural childbirth, she is supportive of whatever educated choices her clients make for themselves and their babies. Cristin believes that all mothers and babies deserve the very best start possible, as well as the best care possible during this special time in their lives. Not only does she believe it, she lives it and goes the extra step to make it possible for women in her community. 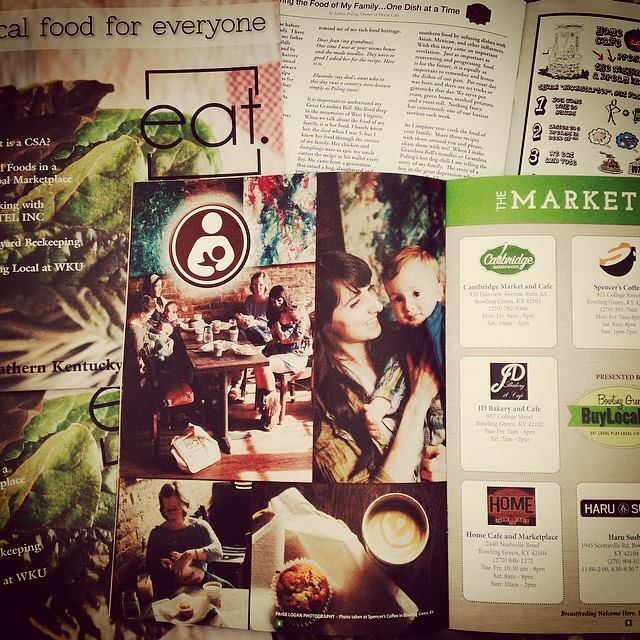 John Lynch, editor of Lexington Family Magazine has actively sought articles, event listings, and resources information to support breastfeeding families in Central KY since the magazine’s inception. Their June issue features Maternity-related content, and every year there are at least two offerings concerning breastfeeding. John often seeks additional content through the year when ‘hot topics’ about breastfeeding arise, so that Lexington Family Magazine can provide evidence-based information that does not fuel the flames of hyperbole. For example, the magazine ran an article on Birth Kangaroo Care in 2012 in conjunction with the Kentucky Kangaroo Care initiative. When John developed a spin-off publication, The Baby Bump, as an annual resource guide for all things pregnancy, he actively sought out information on breastfeeding resources for pregnant and parenting mothers. More than just a resource list, Baby Bump features articles in their publication, and also manages public and private Facebook pages. When breastfeeding issues arise on their Baby Bump FB page, John is sure to request expert advice for a response. Through the FB stream, and their on-line articles, Lexington Family Magazine has been able to spread their reach more broadly, expanding beyond Central KY. John and Lexington Family Magazine have made a big difference in making breastfeeding easier in Kentucky. Ana Maria Linares is an Assistant Professor and researcher in the College of Nursing at the University of Kentucky and has played an important role in breastfeeding advocacy, both at the university level and statewide. Her love of research and commitment to mother and infant health has made a difference in the life of many of her students and co-workers by increasing knowledge and changing attitudes about breastfeeding at all levels. Her passion about breastfeeding has inspired others to advocate for breastfeeding and to continue on this work. – Increasing the number of breastfeeding education hours that nursing students receive. – Developing a survey for all nursing students to assess knowledge and the need for further education on breastfeeding. – Incorporating a policy in the college of nursing to allow students to have break time for pumping milk during their school time. – Working in multi-disciplinary groups to ensure those in other scientific fields understand the importance and benefits of breastfeeding. Her work has specially focused on increasing exclusive breastfeeding in Hispanic women and she has promoted breastfeeding in the Hispanic population in KY by writing articles in the local Spanish newspaper. Dr. Linares has presented her research on breastfeeding in Kentucky at several national conferences and is publishing her work in a peer-reviewed journal. Her interest in breastfeeding research and support has recently expanded to support in the workplace and childcare centers. Dr. Linares isn’t just a researcher. She carefully plans her research so that it may inform policy change. LINK is especially excited that Dr. Linares will be joining our board of directors as we believe her involvement will greatly increase our capacity to begin implementation of evidence-based projects to support breastfeeding. The Kentucky WIC Program is sponsoring a Certified Lactation Specialist (CLS) Course June 2nd – 6th at the Knicely Center in Bowling Green, Kentucky. This certification is a stepping stone to the IBCLC credential. It is hoped that those who attend the course will ultimately become board certified, although that is not a requirement. During this very practical course, participants will be taught how to use appropriate counseling skills, how to teach mothers and families, and most importantly, how to function hands-on as a clinician. Registration for this course is limited to Registered Dietitians (RD), Certified Nutritionists (CN), Registered Nurses (RN), Licensed Practical Nurses (LPN), Physicians (MD), Advance Nurse Practitioners (ARNP), and Physician Assistants (PA) who wish to improve their knowledge base and skills in working with the breastfeeding dyad. All areas included on the IBCLE exam are addressed. The course provides the needed number of continuing education in lactation to qualify to sit for the IBCLE exam. Certification as a lactation specialist is achieved through attendance of the entire course and successful completion of the end of course exam on the last day. A block of rooms has been reserved at the Staybridge Suites for a reduced cost under Kentucky Certified Lactation Course. The LINK Board of Directors presents the following individuals as nominees to serve on the Lactation Improvement Network of Kentucky’s Board of Directors. Per LINK Bylaws, members vote on the slate of candidates for the Board of Directors and the Board of Directors determines the officers. Members are voting yes or no on whether to accept the entire slate, not individual candidates. Please review the slate and use the url in the LINKed Up! Newsletter to cast your vote. Ana Maria Linares graduated in 1981 and received her degree in midwifery from the University of Chile. She earned a Doctor of Nursing Science degree in 2006 from the University of Nuevo Leon in Monterrey, Mexico. She obtained her RN license in Kentucky in 2009 and in 2012 the credential as International Board Certified Lactation Consultant (IBCLC). Dr. Linares previously worked as Associate Professor in Chile, where she served as a Dean at the College of Midwifery and as a professor of obstetrics and neonatology. She also served as a breastfeeding consultant and specialist at the Chilean Department of Health Services. Currently, Dr. Linares is an Assistant Professor at the College of Nursing, University of Kentucky, where she teaches obstetric nursing in the undergraduate program. Dr. Linares has also initiated a program of research on health disparities with emphasis in promotion of breastfeeding. She is conducting several studies on breastfeeding including promotion of exclusive breastfeeding among Hispanic women; implementation of break time for nursing mother police; and accommodation for breastfeeding infants in childcare facilities. Dr. Linares has disseminated findings in peer-reviewed publications and through oral/poster presentations at national and international conferences. Nicole Peritore is the program coordinator for the Health Education through Extension Leadership (HEEL) Office at the University of Kentucky. She moved to Kentucky in 2005 and earned a degree in Exercise Science and Masters in Health Promotion. She also holds a Graduate Certificate in materinal and Child Health from the Department of Public Health at the University of Kentucky. Nicole has written for extension’s Families, Food and Fitness Community of Practice and the Journal of Applied Nutrition, Physical Activity and Metabolism. She has presented her work at the Robert Wood Johnson Active Living Conference, and the American Association of Health, Physical Activity, Recreation and Dance, among others. Nicole currently works to update and maintain health related programming for Cooperative Extension Service, Family and Consumer Science Agents. Nicole has a wonderful, supportive husband and 2 young boys that keep her laughing and learning. Mandy received a Bachelor of Science in Dietetics at Miami University, and a Master’s in Public Health from the University of Cincinnati. She has been an IBCLC for 2 years. Before leaving to take care of her daughter, she worked as a Registered Dietitian at the Northern KY Health Department for 7 years. While at the health department she became passionate about helping breastfeeding dyads, and served at the Regional Breastfeeding Coordinator for 2 years. Mandy lives in Cincinnati with her husband and 6 month old, breastfeeding daughter. Denise Barbier is an occupational therapist at the University of Louisville Center for Women and Infants Neonatal Intensive Care Unit and has over 20 years experience in the specialty of infant feeding. In addition to co-leading the Baby Friendly designation effort at University of Louisville Hospital, she coordinates and conducts workshops for birthing hospitals to implement birth Kangaroo Care and is the co-author of the “Jumping into Kangaroo Care” Toolkit. Denise & her husband Bob of 35 years are native Texans and have two married children. Julie Jacobs served as a La Leche League Leader from 2001-2005 in Columbia, Missouri and worked with the Missouri breastfeeding coalition during that time. She earned her Master of Public Health degree in 2010 at Saint Louis University and then moved to Lexington later that year when her husband began a faculty position at the University of Kentucky. For the past three years, Julie has worked as a research consultant for Washington University in St. Louis. Her work has primarily focused on studying the process of evidence-based decision making in public health, with an emphasis on the tools and skills that practitioners need to integrate research-proven interventions with community needs and available resources. As part of her work for LINK, she is the Project Director for our Continuity of Care Community Implementation Project, funded by the US Breastfeeding Committee and the Centers for Disease Control and Prevention. Cerise was inspired by her own pregnancy, birth and parenting to open Mother Nurture, a shop providing parenting resources that were lacking in Lexington at the time. Cerise graduated from Transylvania University in 2001 with a Bachelor of Arts in Sociology and Anthropology with a focus on women’s issues as they relate to Mothering. She worked with preschool families for 7 years before opening Mother Nurture in 2006. In 2007, Cerise became certified as a Lactation Counselor and expanded the breastfeeding support services at Mother Nurture. Cerise became the first president of the Lactation Improvement Network of Kentucky (LINK) in 2011. . In 2013, Mother Nurture closed and Cerise returned to the field of early childhood education as Executive Director of Growing Together Preschool, Inc, Central Kentucky’s first program integrating children of various abilities and advantages in the same program.